Larissa Miller was born on the day the worlds collided, the day where realities feature just about every supernatural creature you can think of suddenly fused into the realm of humans. Terak, the leader of a tribe of Gargoyles, is told by the Oracle that a human woman holds the key to success for their species. He takes it upon himself to watch over her from afar. She’s seemingly normal, and when he just about gives up on anything happening with her, she’s attached by a swarm of necromancer-controlled zombies. He sweeps in to the rescue, and in the process, changes everything about the way Larissa viewed her sheltered world. Okay, I have a love-hate relationship with this book. I really enjoyed the premise. 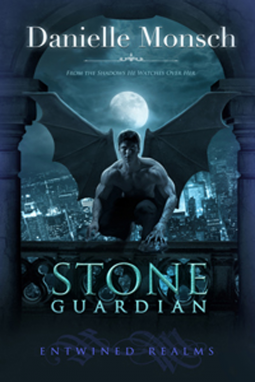 I love a good urban fantasy, and it’s not often we get a gargoyle-themed story that’s not…ugh…reminiscent of that cartoon I used to watch after school. Well, Ms. Monsch delivers on premise. This, I loved. Unfortunately it didn’t hold me all the way through the end. Perhaps it was just predictability in the plot, or maybe I just got a little bored by the banter, but I actually ended up not finishing this book. I didn’t push myself too hard, though, and I think that’s because I could guess how it ended up playing out in the end. Which is is shame, because for all I know maybe something crazy happened that would have swept up all my expectations. Nonetheless, I’ll never know because I really don’t have a desire to finish it. For the most part I enjoyed the main characters but found myself skimming through exchanges with supporting characters, and that’s a shame because they end up playing a fairly significant role in our lead’s destinies. They didn’t hold my attention. And the leads…Terak was okay for me. Larissa…the whole trope of “perfect, all-American, innocent & naive virgin” almost…ALMOST…worked. She had moments where she even said to herself that she didn’t want to be *that* person, but…SHOCKER…she ended up being it anyhow. Her attachment to her overbearing family is a bit overdone, and I thought it got old kind of fast. I think certain people will probably find this book very enjoyable. If you like urban fantasy and are looking for some pretty intense world building that still manages to be somewhat unique, give Stone Guardian a go. I wasn’t really invested enough to finish it, though I have to give it props for what it tries to be.